As the Travelin' Nine head to Chicago, the team is filled with hope and optimism. After a disappointing loss in Cincinnati at the start of their baseball tour, the heroes of the Spanish-American War bounced back in Louisville. 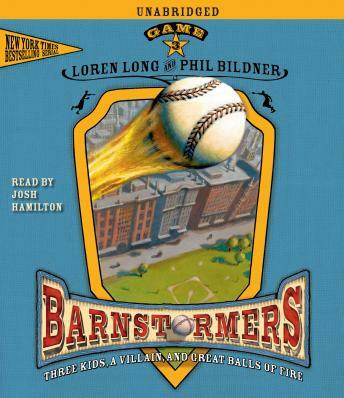 Doc and Woody came through with timely fielding, Crazy Feet and Tales smacked clutch hits, and champion horses provided that extra kick, helping the barnstormers to their come-from-behind victory. By the end of the thrilling contest, there was no doubt in the minds of Griffith, Ruby, and Graham that the baseball their Uncle Owen had given to them on the night of their father's funeral was magical. Indeed, the mysteries surrounding their baseball, which their uncle had urged them to keep secret, were deepening. And as excited as they were by the barnstormers' win, the Payne siblings' fears and worries continued to grow. Uncle Owen's tattered, bloody letter had warned them about the Chancellor. What's more, they'd seen the Chancellor's men lurking at the Louisville game. Griffith and Ruby now realized that their adventure was about far more than raising money to pay off a family debt. But what exactly was it about?